Green Groups fighting to save our environment are often up against large corporations. I came across a David and Goliath story today which I thought would spur on all those battling against the odds. In June 2013 the U.S. Supreme Court issued a unanimous ruling that naturally occurring DNA is not patentable. However, this has not stopped companies using legal threats to stop competitors from offering cheaper drugs or treatments or doing research in areas where they have been making mega-bucks. US-based biotech Myriad Genetics is one such company. For many years it had a monopoly on testing for human BRCA 1 and BRCA 2 genes which are a good indicator of cancer risk. According to Breast Cancer Action in the US 'With nearly $9 million in monthly revenue from BRCA testing, anything to prolong their monopoly by even a few months is money well spent for Myriad.' Their poster below is ironic in the extreme. 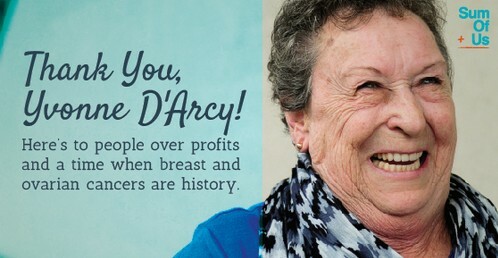 In January 2015 it was reported that Myriad had finally stopped their quest to retain their monopoly on the BRCA genes. Myriad announced they’re settling or will settle with other companies offering genetic testing for BRCA mutations. 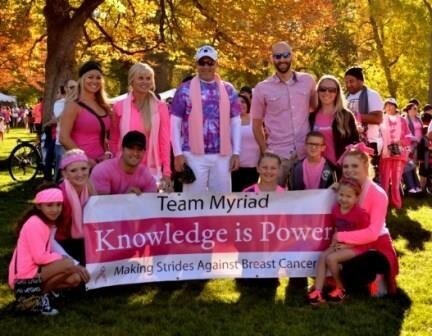 At Myriad, our passion for patients drives everything we do – on the job and in the community.